The Krone Limited Edition Marilyn Monroe celebrates the life and beauty of the legendary actress and popular film icon. The extraordinary fountain pen is made of a velvety ivory celluloid with Marilyn Monroe's signature engraved into the barrel in gold, contrasting beautifully with the ivory barrel. The cap of this pen has a golden overlay which contains a smudge of Marilyn Monroe's personal red lipstick surrounded by pavé diamonds. Inside the top of the cap is a viewing window through which one can gaze at her famous image. 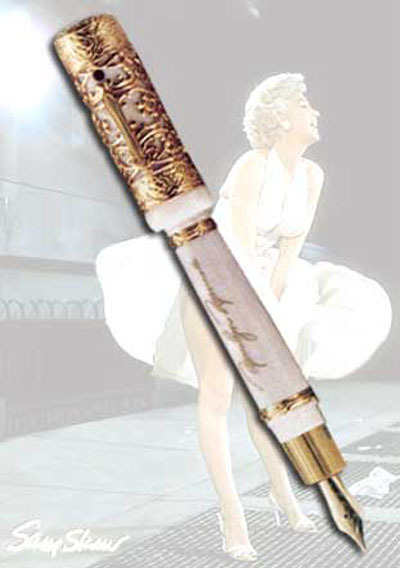 The Marilyn Monroe is a limited edition of only 288 fountain pens and 18 rollerballs. The pens have 18kt gold nibs.